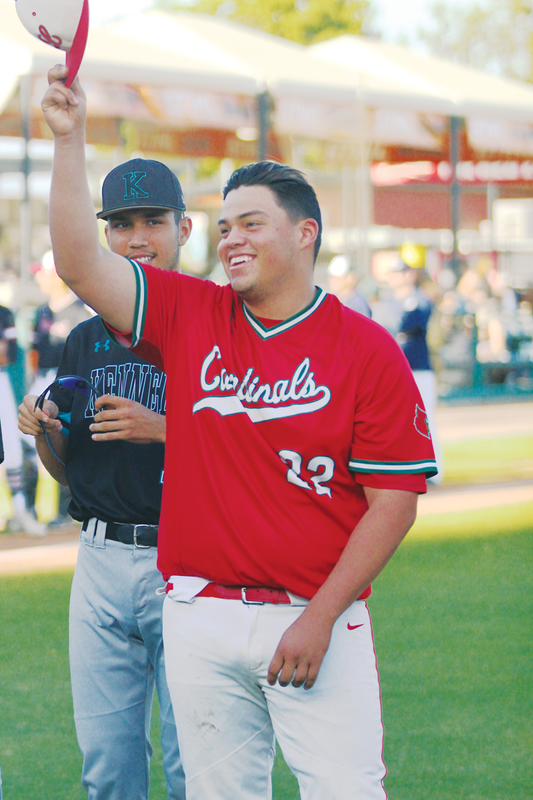 VISALIA – Lindsay’s David Jimenez put on the red and white jersey of the Cardinals last Saturday for one last high school baseball game at Recreation Park. Grabbing his white ball cap which had some of his teammate’s signatures underneath the bill he waited for his time to take the mound during the 58th annual East-West All-Star Game. One last time he got the chance to throw a baseball. A chance which was put in jeopardy after he was involved in a car crash before the season began. On Valentine’s Day of this year, just three days before the Cardinals season opener against the Fresno Warriors, Jimenez was on his way home from Porterville. Riding as a passenger Jimenez was rear-ended. In the accident he used his hands to brace himself against the dashboard. Right after the crash Jimenez felt fine, and thought he would walk away injury free. Unfortunately that was not the case. A couple hours later his left hand began to swell prompting a visit to his doctor. After x-rays of his glove hand reveled it had been broken in two places the doctor recommended surgery. In danger of losing his entire senior season Jimenez refused. Ultimately deciding to forego the surgery Jimenez was fitted for a cast a week later. Moving forward with the cast meant he only stood to lose the first couple of month of the season and return in time for East Sequoia League play. The importance of Jimenez’s play on the team could not be understated. Just the year before as a junior Jimenez went 7-2 for the Cardinals with a 1.79 earned runs average, and 79 strikeouts. His performance in 2017 made him the clear cut choice to be Lindsay’s ace. Through the first eight weeks of the season the Cardinals clearly struggled, going 0-5 without Jimenez on the mound. While he could not pitch for his team he was a motivational leaders from the dugout. Yet, the encouragement did not just go one way. Jimenez’s fellow Cardinals showed their support of their injured pitcher by signing the underside of the bill of his ball cap. It’s an older tradition for certain but all he had to do was look at the names of his teammates and it gave him purpose to keep on going. Before long Jimenez’s hand had healed and his spirits brightened. In his first outing he pitched six and two thirds innings and struck out eight in a 4-3 win over Strathmore. Eventually, he led the Cardinals to the D-VI CIF Valley Championships where they defeated the Bishop Union Broncos, in an exciting 7-6 finish. And last Saturday Jimenez capped off his senior season as an All-Star, pitching for the East squad. The West went on to win 9-3 and Jimenez came in during the middle innings and by the bottom half of the fifth the West had a 3-1 lead. A double and a single during the inning scored three runs which made it 6-1 West. Those were the only runs he surrendered as he struck out three batters before being pulled at the end of the seventh. While the performance wasn’t his best he was still grateful for the chance to get back out on the diamond. He will now head off to Porterville College and compete for the Pirates. “This is really emotional that this is my last high school game before going off to college,” Jimenez said. In the eighth inning the West squad secured the final score. Responsible for two of those runs was Golden West’s Payton Allen. Golden West’s Payton Allen hits the ball during the eighth inning as the West wins 9-3. Photo by Patrick Dillon. An error scored Redwood’s Davis Beavers to make it 8-3. Then one batter later Allen was brought in by a Brett Dennis double to right field. “It felt good to play again,” Allen said. Allen’s season had ended close to a month before most of his West teammates when the Blazers were eliminated by the Highland Scots 7-3 in the opening round of the D-III playoffs. Before that Allen had been hitting an outstanding .500 batting average. He led the team with 38 hits, 24 runs scored and 20 runs batted in. The West squad wasted no time getting on the board. Errors by the East infield and passed balls by Lindsay’s Mark Ibarra at catcher allowed base runners to get into scoring position. The West put on a double steal which scored Jared Holaday from third for the first run of the game. Tiger teammate Jared Foote made it 2-0 a few pitches later on the third passed ball of the inning. As for the East squad all their offense was produced by players from Tulare teams. Tulare Westerns David Alcantar drove in Mustang teammate Ryan Tucker in the top of the fifth to make it 3-1. One inning later a single by Mission Oaks Cristobal Cortez brought in two more runs. At the time it made the game 6-3.